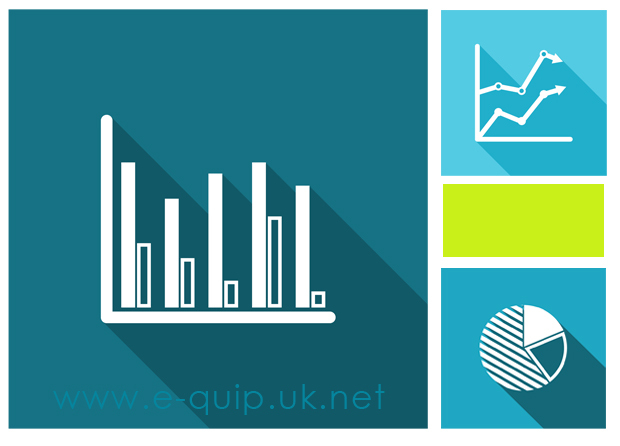 Did you know that e-Quip, the UK’s market-leading medical device asset-management database system, can also be used to plan, record and monitor device-user training? Effective training management comprises several strands and e-Quip allows you to manage all of them within a single application, as recommended by the MHRA. Not only does this simplify your processes and take the sweat out of CQC audits, but data only needs to be maintained in a single source, making change-management simpler. Training Needs Analysis – Who needs to be trained and when? Is it enough to train someone and then just assume that they are then fully competent? ESR, the NHS Electronic Staff Record, is the ideal source for information about people and provides accurate information about people’s work locations and roles, both critical in assessing training requirements. Put that together with e-Quip’s device register (probably the most widely-used within the NHS) and you have the perfect foundation on which to build your training management. Knowing who works where, the roles in which they work and the devices used at those locations is fundamental to your Training Needs Analysis, or TNA. Risk is yet another key factor in constructing your TNA. With limited resources available training needs to be targeted at the highest risk devices. e-Quip supports separate risk assessments for several purposes, such as training, planned maintenance, decontamination etc. Effectively this is the definition of training requirements. i.e. What level of competence is required by different groups of people on different devices and how that competence is to be achieved. Which staff grades, if any, are authorised to self-certify competence on different types of device? Are professionally registered staff authorised to self-certify competence? What training has each person received, has their competence been assessed and when is refresher training required? The much-simplified example below shows a location-based competence group. 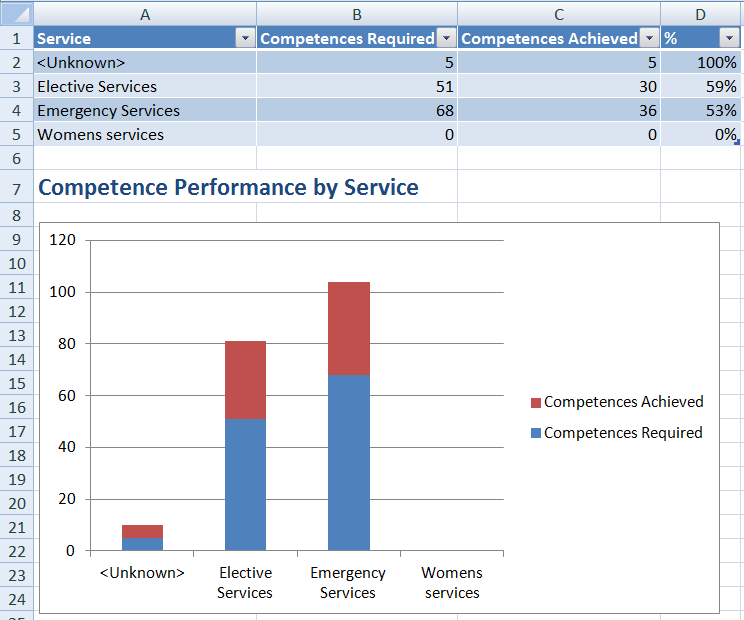 This important screen combines the information from every competence group. It can be searched based on absolutely any combinations of criteria. e.g. Show only records for HCA’s and high-risk devices within the Cardiology Department where the required competence level has not been achieved. This screen supports direct in-grid editing, single-record editing and bulk update. For example, a nurse might simply tick a box in the grid to indicate that she has self-assessed herself as being competent to use portable suction devices. 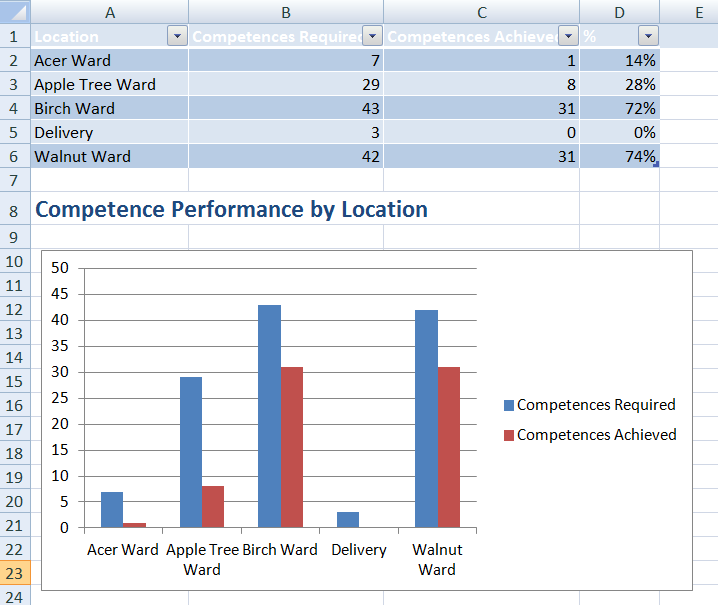 Alternatively, a trainer having just delivered a training course to a group of nurses in Apple Tree Ward might select multiple records and update the competences in a single action. Training management requires reporting on an enormous volume of data. Although the row-by-row presentation style is ideal for data management many people cross-tab reports to be more meaningful. Below you can see how the information has been transformed so that there is a single row per person with a column for each device. Compliance and gaps are displayed using a RAG (red, amber, green) colour coding. The percentage compliance is shown for each person along with grand totals. Procurement with e-Quip – Part 3, Let’s Buy Something!